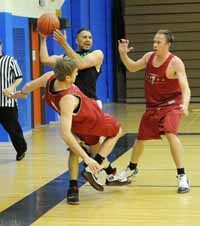 Talent, teamwork, timely defensive stops and clutch shots on offense are the ingredients that have helped the Jivaro Headhunters men's basketball squad to 10 Outlaw League tournament championship game berths in 11 years. Jivaro (16-0) went back to the well of its success and won its sixth league title Friday 64-54 over the upset-minded Coeneo squad (12-5) at the Community Campus gym in Hailey. Mike Payne (16 points, 2 rebounds, 2 steals) and Stephen Vouch (15 points, 2 steals, 2 assists) led the undefeated winners, who put all nine players into the scoring ledger. It was Jivaro's second unbeaten season in three years—and third title in four seasons. The Headhunters were the league's top defensive team, holding opponents to 46.9 ppg while scoring 67.3 ppg. Coeneo was second best at 63.4 ppg offense and 53.5 ppg defense. Despite Jivaro's league dominance, 53-42 and 57-54 previous wins over Coeneo and the 10-point spread in the final score, the Latinos from Coeneo never went away Friday. Jivaro led nearly all game, from the 11-11 mark early in the 25-minute first half to a game-high lead of 40-32 in the second. That's when Coeneo's Antonio "Tona" Hurtado put on a shooting display—hitting 12 of his 14 second-half points (18 for the game) and carrying Coeneo on a 14-5 run for its last lead of the game at 46-45 with 9:53 left. Jivaro's precarious lead was 51-50 with five minutes left when Buddy Peterson (7 points, 4 rebounds, 3 steals, 6 assists) connected with Adrian Charbonnet (6 points, 4 boards) for a transition bucket. Charbonnet made the game's biggest defensive play, blocking Hurtado's drive through the paint. The Headhunters made seven 3-pointers on the night but were stuck in neutral on offense until guard Jay Fry (4 points, 4 rebounds, 2 steals, 2 assists) started penetrating. Fry made a steal on defense, drove the lane and passed off to Payne, who scored for a 56-50 lead. Fry took the shot himself with his left hand on another drive and stretched the lead to 58-52, then Peterson canned two free throws to virtually ice the game at 60-52 with 1:07 left. Other Jivaro contributors were Darryl Tullis (8 points, 4 rebounds, 3 steals, 2 assists), Mike Scullion (3 points, 4 boards, 2 assists), Dan Willett (3 points) and Ben Sinnamon (2 points). Jivaro shot 17-of-25 (68%) from the free throw line, compared to Coeneo's 4-of-6. League Most Valuable Player Ricardo "Papas" Paredes of Coeneo (13 points, 9 rebounds) showed flair and amazing talent all game, while Jesus Villaneuva (13 points, 8 rebounds, 3 steals, 4 assists) and Raul Villaneuva (5 points, 4 boards, 2 assists) were tough. "Cano" Martinez chipped in with 5 points, 5 boards, 3 steals. Adrian Charbonnet, Buddy Peterson, Stephen Vouch, Mike Payne, Ricardo Paredes, Jesus Villaneuva, Mitch Smith, Eric Stumpner, David Morgan, Sean Johnson, Luke Macdonald, Mike Bellamy, Bryan Tidwell, Greg Edwards, Wes Southward, Riley O'Grady, Paul Zimmerman, Brent Clive III, Marshall Turner and Kyle Bennett. Atkinsons' Market/Hayden Beverage sharpshooter Mitch Smith averaged 29.2 ppg in five tournament games. TEAM, SEASON REC. RECORD. OFF, AVG. DEF, AVG.